The Abyss is one of those limited release imperial stouts that everyone looks forward to year after year. The beer might not have the following of Goose Island’s Bourbon County Brand Stout, but it’s well-received, and for good reason. Rich, fruity and boozy…it’s everything you want in a big, bold stout. And this year, Deschutes decided to go the extra mile and take that annual Abyss and put some of it in Cognac barrels, and some of it in rye barrels, aging two different varieties for a year each. And then they sent us all three bottles. So I did the only thing you can do when there are three different versions of the Abyss in my possession at the same time. I invited a couple of friends over to drink all them at the same time to see which we liked best. Here’s what we came up with. The “regular” Abyss is a ridiculous beer all on its own, brewed with black strap molasses, licorice, cherry bark and vanilla. Awesome, right? Then they age 21% of that beer in bourbon barrels, 21% of it in oak barrels, and then 8% of it in wine barrels. The result is a beer that pours dark, with some rosy layers around the edges and is absolutely swimming with all kinds of malty notes. We can pull the molasses out right away, along with the cherry, which practically dominates the taste through much of the sip. The various oak barrels make a strong show with some acidic, tannic notes. It’s also boozy as hell, thanks to that 12% ABV, and has a great roasted character that’s just faintly like strong coffee. So, yeah, there’s a lot going on. Maybe too much? The majority of the tasters drinking this version said they liked it, but could only handle so much of it. Like cheese cake, or a Russell Brand. It’s a helluva beer, and I drank it wondering what the hell more barrel aging could possibly add to the experience. 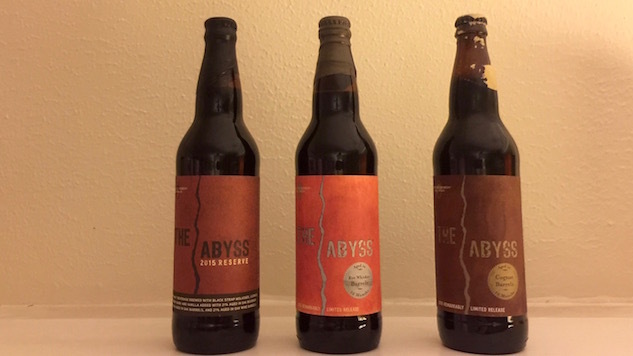 The Abyss in Cognac barrels pours so damn black, I’m actually worried about it. “It looks like a Spinal Tap album cover,” one taster says. It has a sweet, cordial-like nose, which makes sense because of the year spent in Cognac barrels, but the booze also comes through in the nose. Add the pitch black tone and sweet nose, and you have an intriguing combination that I’m both eager and scared to drink. But a funny thing happened to this beer inside the Cognac barrel—it got mellow. The oaky acidity is gone, as is most of the cherry, which dominated the original Abyss. More vanilla and caramel come through in their place. It’s as if the Cognac barrels even out any of the harsh edges of the original Abyss. It’s a pretty cool trick, and not at all what I expected, mostly because I’m not a fan of Cognac. Because Cognac tastes like burning. But apparently, I am a fan of imperial stouts aged in Cognac barrels. While the Cognac-aged version surprised me because of my low expectations, the rye-aged version has a lot to live up to, because I love rye, as do most of the tasters. Like, “can a man marry a booze?” kind of love. The beer doesn’t pour as dark as the Cognac version, and doesn’t come off as sweet, either. The acidity from the barrel is back, and so is the cherry, but those extra sweet notes that the Cognac barrel brought out are non-existent. No vanilla, no caramel. Instead, you get that peppery spice rye is known for, and even more oak, and an incredibly dry finish. While the Cognac barrels softened some of the sharper edges of the Abyss, and enhanced the sweetness of the original beer, the rye barrels act as more of an adjunct, simply adding even more layers of flavor to an already complex beer.